Anyway, every other year we go to Sweden to see his family. His parents have a summer house near the Swedish and Norwegian border on a small island called Rösso. As beautiful as it is, the island is in Sweden, which means that the water is not exactly as, um, “pleasant” as it is here in Hawaii. The ocean is substantially cooler than what I am used to and with that cold water comes jellyfish. LOTS of jellyfish. Needless to say, in years past, I haven’t been eager to spend as much time in the water as I do in my everyday life. This year, however, something awesome happened…Surftech came out with an inflatable standup paddleboard. The 10’6 airSUP comes with it’s own travel backpack and when deflated rolls up perfectly into a travel friendly, self contained piece of luggage. Now, if you have ever traveled with a standup paddleboard, you know that it isn’t the most convenient thing to do…board bags are big and awkward and it seems like your board almost always comes through looking like it was dragged across the tarmac. With the airSUP, this isn’t the case, in fact, the board travels so well it managed to make it to Gothenburg unscathed even when the rest of my luggage didn’t. At the airport, we waited and waited for the rest of my belongings to show up, but they never did. It was somewhat frustrating, but really…who needs clothing anyway? I learned a long time ago that there are two things that you should always have in your carry-on: a toothbrush and your bathing suit. I had come prepared, and we were off to the summer house in no time (my bags did eventually show up, just not as quickly as I had hoped). 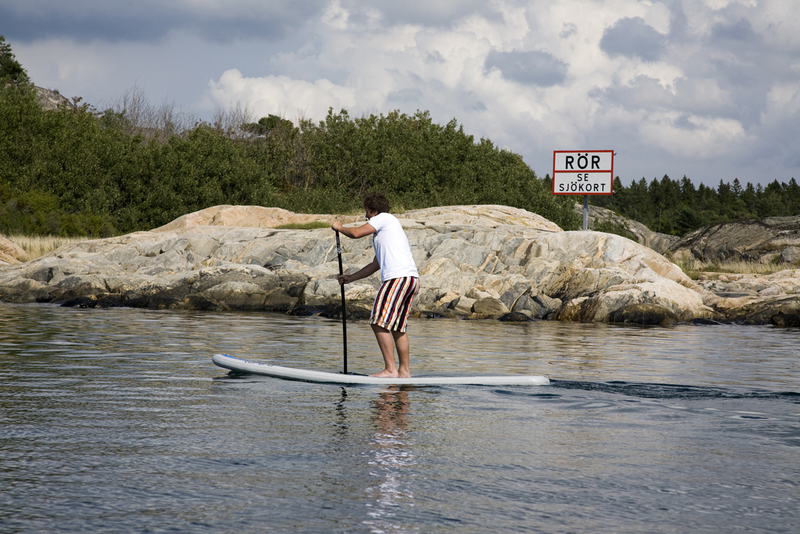 As big as standup paddling is here in the US, it hasn’t really made it’s way to Rösso yet. Once the boys had the board inflated and we started paddling around, we got a fair bit of attention from everyone in the water. Anders’ brother Kristian was the first Swede to try, and once he got the hang of it he was paddling all over the place with us following in the boat. Kristian paddled us over to “Swedish Pipe,” where he demonstrated his awesome board style reminiscent of Gerry Lopez. Kristian assured us that Swedish Pipe is every bit as extreme as it’s Hawaiian counterpart, we must have just hit it in between swells…typical. Next it was time to test the board behind the boat. Swedish Pipe hadn’t shown us any waves and it was clear that if we wanted to surf, we would have to make the waves ourselves. Anders’ friend Daniel was the second Swede to give it a go, and he didn’t seem to have any problem with it either. The rest of the day was spent surfing behind the boat, dodging the jellyfish…seriously, those things are EVERYWHERE…yikes. This particular day in Sweden is exactly why I love standup paddling. Anders’ family summer house is a place that I have been several times before, but this time standup allowed me to see the area in a different way. The versatility of the sport makes it so much fun for anyone who wants to give it a try. To be honest, going into this trip I was a bit hesitant to bring the board. I was worried that it was going to be a pain to carry around, that we wouldn’t even use it, etc., but the airSUP proved me wrong. It was no more difficult to travel with than any other piece of luggage and we had a lot of fun on it that we wouldn’t have had otherwise.